KitchenAid Ice Cream Maker Just $46.99! Down From $100! PLUS FREE Shipping! You are here: Home / Great Deals / Amazon Deals / KitchenAid Ice Cream Maker Just $46.99! Down From $100! PLUS FREE Shipping! This is something you shouldn’t miss! Check out the KitchenAid Ice Cream Maker which is on sale at Amazon for just $46.99 down from $99.99 PLUS FREE shipping! Favorite frozen treats created in no time. Create 2 quarts of soft-serve ice cream, sorbet, or gelato in 20-30 minutes. Allow bowl to freeze at least 24 hours prior to use. Ice cream maker attachment produces up to 2.0 quarts of soft-consistency ice cream and other frozen desserts. 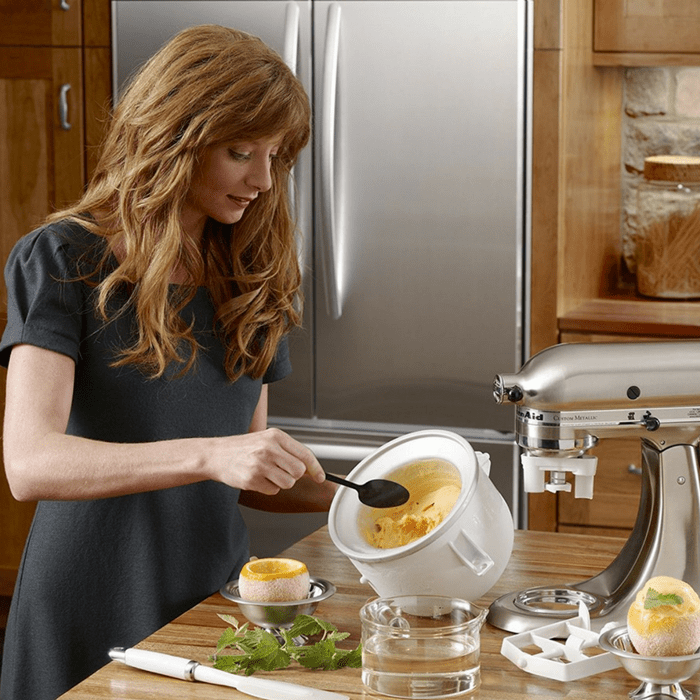 The dasher rotates inside the freeze bowl to spread, scrape, and mix the batter. This is perfect for all occasions! Makes up to 2.0 quarts of ice cream, gelato or sorbet in 20-30 minutes. Dasher rotates inside the bowl to spread, scrape and mix thoroughly.